Everyone needs to read the book which is a “hands on” practical application of valuable sales techniques. When practiced, these techniques will help your team significantly increase their sales ability. They will be given 2-3 weeks to read the book. A sales contest will then be conducted by SALESTALENT in your office. Each person will roll dice and score points if they get the correct answer. The person or the team with the highest score receives an award. In this seminar you will learn strategic methods for organization, recruiting at a local, regional, or national level and systems to sustain and increase sales. Measure “Sales DNA” – quantifying (from 0-10) the 12 key attributes, including assertiveness, stamina, prospecting, closing, etc. How you market your business will ultimately affect your bottom line. In this seminar, you will learn how effective marketing is about ideas, innovations, and systems versus spending a lot of money on advertising. Harvey Firestone said, “Ideas, not money, are the capital of a business.” What is the real value of a new market? A new product? A new distribution channel? Marketing is ideas and vision. What new value-added services/products can you provide? Solve Problems: Every sale is really a solution to a problem. Questions: A high performance salesperson asks good, pointed questions (probing) to uncover problems and needs. In the classic sales presentation, the salesperson actually listens 65% of the time and talks only 35% of the time. The vast majority of salespeople talk 80% of the time and only listen 20% of the time because they have not realized the importance of probing. Persistence: Approximately 80% of all sales occur between the second and fifth call. However, the vast majority of salespeople quit after the first call. 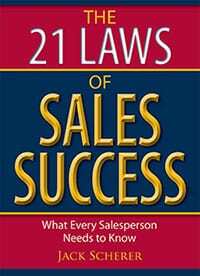 Furthermore, only 20% of all salespeople make the third call…and that is when the majority of sales occur. Trust: Approximately 80% of sales are lost because the salesperson failed to establish an element of trust and credibility with the prospect. Emotions: Approximately 65% of all buying decisions are emotionally based. We all have a tendency to make purchases from an emotional perspective…and then justify those decisions somehow from a rational perspective. Sell to the heart first; the head second. Decision Makers: Approximately 65% of all sales calls in any industry are made on the wrong person. Be sure you are presenting to the correct decision maker. Sales Objections: Successful presentations contain approximately 50% more objections than non-successful presentations, so welcome the objections and then overcome them. Value: Professional salespeople sell value, not low price. A study concluded that in business to business sales, only 14% of all buyers considered the lowest price to be the primary reason for making a purchase. Highest Paid: The highest single paid career in the S. is sales, even exceeding law and medicine. Winning: According to considerable research in the sales profession, the high-performance, achievement-directed salesperson possesses two outstanding characteristics—ego drive and empathy. Their ego drive is the self-motivation that a person intrinsically has to win, and which stimulates them to pay whatever price they have to in order to achieve their personal goals. Empathy is the ability to be sensitive and understand other people’s needs (i.e. the customers). Your sales training seminar for the Society of Human Resource Management received rave reviews. Some comments included:…exceptional speaker…knowledgeable, stimulating presenter…on focus…valuable information clearly presented. Wow! This is the only expression I can offer after your sales and marketing seminar for NAWBO-Atlanta. Thank you for your time, talents and energy. Your sales training seminar was cost-effective and entertaining. The feedback has been great. Your presentation helped emphasize the importance of marketing and provided the tools our clients can use to create a comprehensive sales and marketing plan. We have enclosed copies of the sales training program evaluations for your review. As you can see, all the participants rated your sales seminar as excellent. Your recent 3-day sales training program with our sales team has delivered immediate positive results. We had record-breaking sales this quarter by all salesmen…We are proud of our association with SALESTALENT. Neil Wise Sr.President, Guardian Products Inc.